"Katie the kitten thought she'd apply, She'd never caught mice but she'd give it a try." Little Katie answers an ad to rid Mrs Finnagle's cheese shop of mice. But she's soon to learn that cooperation is better than catching, any day! Charming and colourful, 'Katie the Extraordinary Kitten' is a wonderful tale about working together. An adorable hardback that's perfect for pet fans. 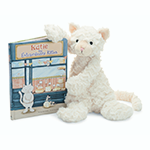 Pair it with Jellycats Katie Kitten plush (Sold Separately) to make a great Birthday, Baby Shower, or Just Because gift.